Everything on a sailboat requires electricity to function. There are radios for both entertainment and VHF on board, instruments vital for smooth sailing, lights, bilge pumps, windlass, and winches, to name a few. Some people also add comforts from home such as refrigerators, portable AC units, and computers. Trolling motors are also very common to assist with shallow water cruising. All of this requires power from a battery bank, so you want to make sure that you're getting the best possible performance when out on the open water. Let's go into what makes lithium ion batteries more energy dense and efficient. The entire time of discharging with lithium ion batteries, you'll have consistent voltage levels instead of drops in power as time goes on. This comes from the fact that lithium ion batteries are able to provide the same amount of voltage output whether they're 20% charged or 70% charged. They can also be safely discharged almost 100%. Lithium ion batteries are able to deliver their full rated capacity, making Peukert's Law not applicable to lithium. Lead acid batteries, on the other hand, always experience voltage drops as they deplete from use. Lead acid batteries are not made to discharge any more than 50% because they will get ruined. When you're running something like an induction cooktop or microwave on your sailboat, you shouldn't have to worry about gradual power loss if your batteries aren't fully charged. Constant voltage vs fluctuations will always equal better efficiency for your sailboat's electronics. Lead acid batteries have been used for years because they're cheap and easily replaceable. What many people overlook is that lead is the heaviest of all non-radioactive metals. In most cases, lead based batteries are more than three times the weight of LiFePO4 batteries. Lithium iron phosphate, LiFePO4, is the main ingredient in our batteries and also happens to be the lightest metal in the world. We don't need to mention that carrying less weight on a sailboat is a huge plus for performance. It's time to replace lead acid with something much more efficient while you're out enjoying the open sea. LiFePO4 batteries don't have to sit a certain way or be stored in a vented battery compartment. This means fewer placement issues during installation. Our batteries are also modular so you can connect them in parallel or series combinations. This makes them popular for sailboats because you can create any custom configuration to get around awkward space issues. With less room on a sailboat, this is an important factor because space optimization is a must. You have less space for battery storage so you will need every bit of wattage that you can get. When using the correct LiFePO4 Battery charger, charging up LiFePO4 batteries is always fast and efficient. Lithium is charged faster because it doesn't require the final absorption phase to get the last 20% stored (that lead acid batteries need). The great thing about charging BSLBATT LiFePO4 batteries is that if you throw them on a charger overnight, it won't damage anything. The BMS that we use in our batteries is built to highest of standards to prevent overcharging issues, cell failure, and overheating during charging/operation. You can also charge our batteries with solar power! We understand that many sailboats use solar these days, so we make it possible to store every drop of sunlight that your batteries soak up. With BSLBATT LiFePO4 batteries, you never have any maintenance to worry about. Flooded lead acid batteries require water to be added over time, are prone to leakage, and generally aren't built to be waterproof. At BSLBATT, these are issues of the past. Once you drop in a set of our batteries you can expect around 8-10 years of worry-free operation. Lead acid batteries are vulnerable to damage from too many discharges and from extended use in extreme temperatures. If they're discharged too deeply or too frequently, they lose potential cycles. At BSLBATT we over-engineer our batteries to withstand whatever mother nature can throw at you. Whether you're a sailor that's into racing, a commercial fisherman, or a weekend warrior, you don't have to baby our batteries because they're built to last for over 2,000 power cycles. 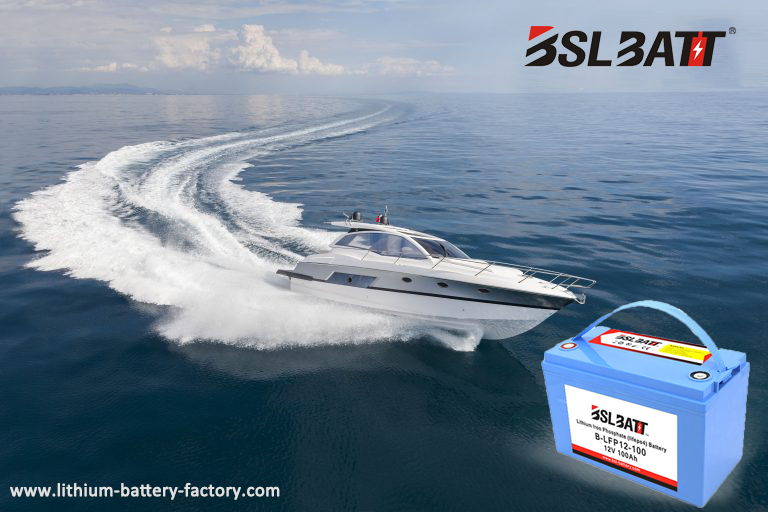 For environmentally conscious boat lovers, LiFePO4 batteries are the only choice because they contain no toxic chemicals. Traditional lead acid batteries are full of extremely toxic chemicals like nickel and cadmium, making them a danger to wildlife.